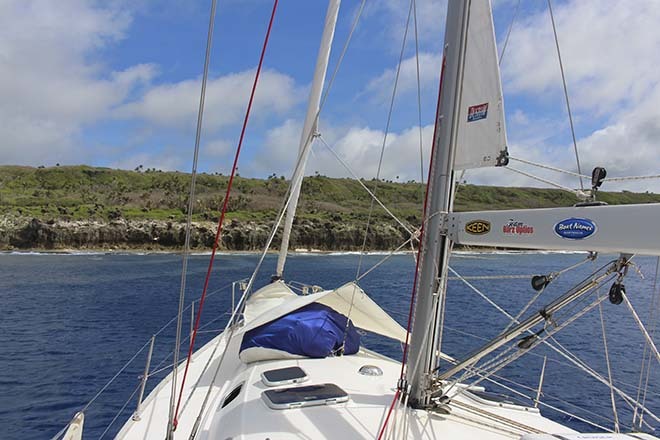 The trip from Maupiti to Niue is 1020nm. We could have gone via the Cooks Islands, however Raratonga is fairly south of the direct path and Aituataki doesn’t have the depth in the channel suitable for anything other than catamarans. So a direct path to Niue was the best option. Our forecast showed us 24-36 hours of steaming before we got to the wind and it ended up being about 42 hours but then the wind came in nicely and the sail was quite fast. 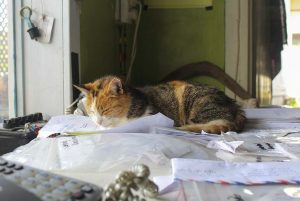 It took us a total of seven and a half days and for a change, we arrived at sun up instead of the middle of the night. 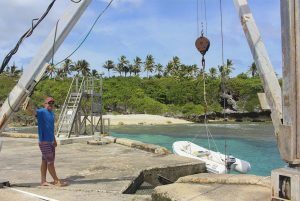 It was a good thing as Niue is a location where you are not advised to anchor, instead you are to pick up a mooring that the Niue Yacht Club install every season. They are taken out for cyclone season every year and when we arrived, there was just one mooring left in, left for cruisers like us that are a bit out of season. 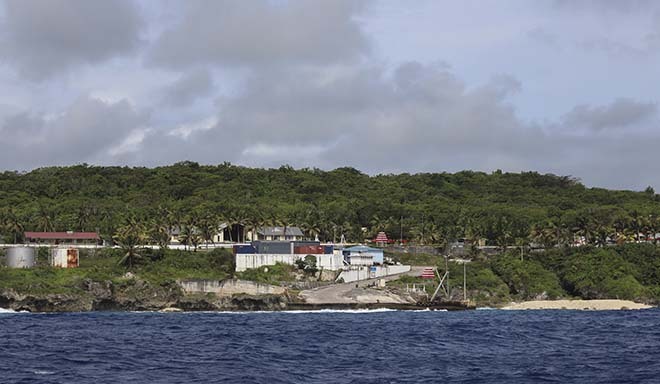 Niue is a small coral island. Being coral, the coastline is stunning because the water is eroding it quite quickly. Its highest peak is just 68m above sea level and if you drive around it you will cover around 65kms. The main township is on the western side called Alofi and is perched up around 30-40m above sea level. The one thing we had learnt about Alofi was that you can’t leave your tender in the water when you go ashore. You have to pull it out at the main dock with the crane and then move it so others can use the crane. 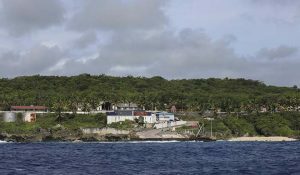 We radioed into to Niue Radio on VHF 16 and the lady kindly organized for us to meet customs and immigration at 0900 that morning. With a slight westerly blowing and a forecast for it to increase, we wanted to get cleared in, get some food and get back to the boat as soon as possible. With a westerly blowing into the bay, it wouldn’t take long for the swell to pick up and hence, no access to the dock, it would become too dangerous. Check in was fantastic. It is a simple thing but it was the first English speaking country we had been to in a very long time, however the people were also very friendly and telling stories of the island and in general, it was a really good experience. The local quarantine guys was even better. He told us that they would take the rubbish, that all food had to stay onboard the yacht, we could take anything off the island we like and if we went spear fishing, they would take our yacht. Pretty simple really, and he did this all with a smile and a laugh. We really enjoyed it. After completing our check in we were dropped up to the tourist information center which I thought was a fantastic thing. It made sense really, if you’re new to the island, where else would you go. We checked out all the tourist attractions and then went for a walk down to the Niue Yacht Club, the biggest little yacht club in the world where no member living on the island has a yacht or even knows how to sail. The club was actually closed for the season, however as it also doubles as Niue Backpackers, it was kind of open. It is a basic club and has a fantastic book swap collection, bigger than most book shops. You can play music on the old record player and they had internet, albeit glacially slow, but that’s Niue. We were told that we were travelling in cyclone season for the umpteenth time since we arrived in French Polynesia. We knew this but were well aware of the systems courtesy of our Predictwind forecasts. 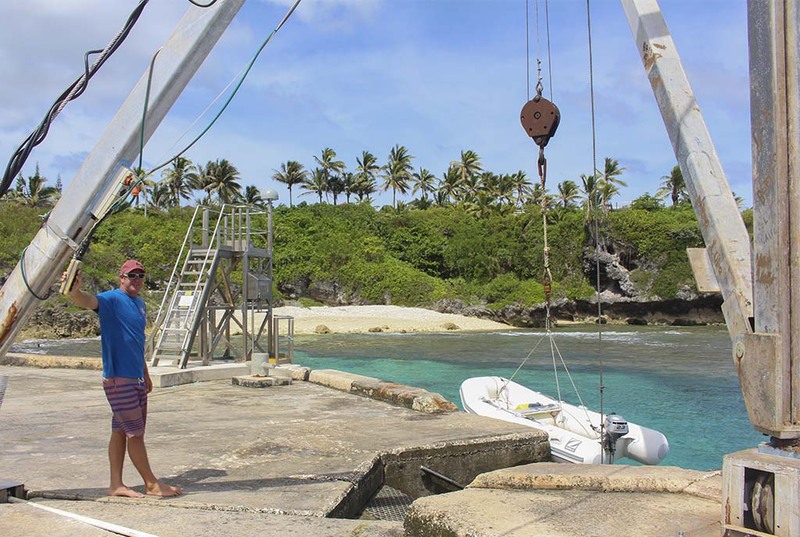 You can become a member at the Niue Yacht club for just $25 so we did that. Moorings are just $20 a day which is nothing really when you take into account it is NZ dollars. After a quick chat and internet catch up, we headed to the shop to get some groceries. Fresh food was in limited supply as they only have one plane a week and that is on a Friday. However they had enough to keep us happy and then Annika bought a can of L&P which is a lemon soft drink and they have a saying on the can ‘World famous in New Zealand!! !’ We got back to our tender, launched it with Annika in it this time and then headed back out to the yacht. We had a plan to ride out the night as we knew the storm was coming but forecasts only had winds up to 18 knots so we hoped we would be fine. We put 3 lines on the mooring and snorkeled to check the actual mooring line. It was 24mm line direct to a concrete block that was chained to another concrete block so plenty of weight. The afternoon was rolly on the yacht as we got sideways to the swell on the odd occasion as the current turned us. We made a decision that with the boat rolling so much, we would actually sleep in separate beds so we could spread out and stabilize ourselves. Annika slept up front so she could hear the mooring as we only had 50m behind us and we would be on a reef, not a lot of room should the mooring or our mooring lines snap. Neither of us slept well and in the morning I got up at 0400 and downloaded our new weather. The winds were going to be stronger than expected so I checked the mooring to find that we had actually snapped one line, chaffed through another line about 30% and actually broke the aluminium lead on the front of the boat. It didn’t take long to get Annika up and we were off the mooring heading for the east side of the island for some shelter from the wind and swell. We cruised pretty slowly as we had the thought that without the ability to anchor we would have to sail back and forwards on the lee side of the island for the next 24-36 hours, something neither of us really wanted to do. We headed around the south end and the coast line was gorgeous. We had not seen it as we approached as it was dark. You couldn’t see a lot of houses on the cliff face, they were all set back quite a distance, except for the hotels. 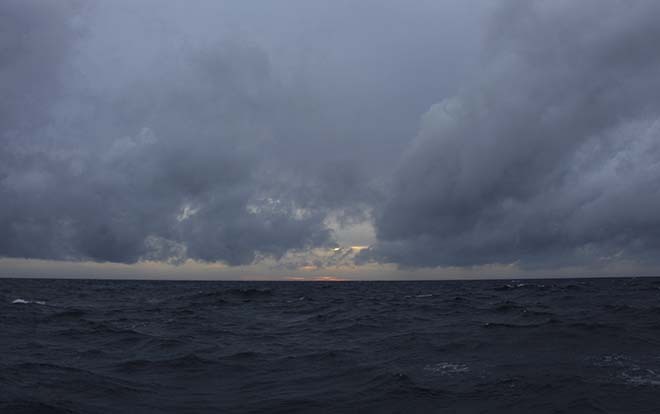 As we rounded the south-eastern corner the swell had died, the wind had died and we looked for a place to anchor. There was a set of steps which on the local map we had was labelled as a kayak launching area. So we cruised in with Annika on the bow. She yelled back at me and said she had found a sandy ridge to drop the anchor. There was one problem though, we were still in 40m of water. The visibility around this island is unbelievable. Being made of coral and limestone, the rain water is filtered and hence no sediment runs off. Instead you have a color of water that is deep blue and is truly magical. We found a spot to drop the anchor in 20m of water and were able to guide it down into a sandy raven to avoid breaking too much coral. To anchor was such a relief. It was a little rolly but to be able to sit and stop was so much better than sailing all day and night. It didn’t take long and we were in the water snorkeling. There wasn’t a lot of coral being the usual windward shore. It was quite a rough coastline and the coral had all been broken so what was there was small and only hard corals. Fish life too was quite sparse. But we were stationary and we would sit here until the next morning. It was a chance to make water, clean the boat and relax, something we really needed. In our next edition we sail around the northern end of the island and explore the land by car.